Senior Investment Manager Max Weatherby recently met senior citizens and volunteers from the Gatehouse project in Bury St Edmunds. Gatehouse is an independent charity working with churches, businesses, local authorities and others to support the vulnerable throughout East Anglia, via a number of projects including a Home store, Foodbank, Dementia Hub and Christmas project. 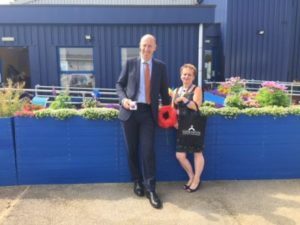 A year ago some vandals destroyed the flower pots outside the charity headquarters, and thanks to the Heart of Hawksmoor charity fund, we were able to replace and improve the facility. In addition, Gatehouse is one of the venues for the upcoming ‘Crafty Poppy workshops’ organised by Bury in Bloom to honour those who served in WW1 in this centenary year. The hundreds of poppies created by children and senior citizens will form an exhibition in the Bury St Edmunds Abbey Gardens later this year. Hawksmoor is delighted to be the lead sponsor of this event. For more information about the work of the Gatehouse project visit the charity’s website.